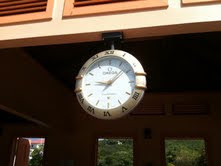 This is the clock on the St. John ferry dock (where my return trip home began). This clock is a centerpiece. It is about 3 feet in diameter, hangs above the waiting area, and really brings the 'room' together. The problem, as I see it, is that this picture was taken at 11:42 am (i wrote it down). That, in a nutshell, is an apropos metaphor for Caribbean travel. This clock, perfectly functional and moving forward at a constant and correct pace, may be one of those rare instances of being able to capture the concept of "island time." Oh how I miss it already. And as long as I am writing about my travels home, allow me to talk a bit about my new pet peeve: baggage fees. This is particularly acute travelling to St. John, as travel there requires a plane, a taxi (to the ferry) and a boat ride (the ferry itself). Today a heard/read a report that Delta Airlines is upping its baggage fees to something like $23 per checked bag. Additionally, over the past 3 years or so, the taxis ($5) and the ferry ($2.50 each) to St. John have added an additional baggage charge to their services. I can only imagine that this trend is happening all over. This seems like the MOST obvious example of charging more money for the same service I have ever seen. And what pisses me off about this is that these people are the travel industry. The whole point of the travel industry is to promote travel and encourage traveling more. This same industry is then penalizing people for bringing crazy things like clothes and toiletries with them as they go. What the hell man. I am currently saving (if I flew Delta, which i didn't in this case) around 60 dollars by packing everything for my trip all in one backpack (which i did). That's a substantial amount of money for me. And this (my unbelievably economical packing job) can only happen because I keep bulky essentials at the house at my destination. In the current economic climate, these completely made up charges aimed at squeezing every last cent out of travelers for a struggling industry will, in the end, backfire. Because it's very obvious in insulting the intelligence of the population they are serving. Which, in this case, is a mostly educated and well off group (you have to be to travel these days--wealthy that is). The backfiring process is already happening. Southwest Airlines has already begun to capitalize on the insanity which is asking people to fly somewhere without luggage by using advertisements (which i admittedly find hilarious) asking why other airlines "hate your bags." More specifically, these commercials are somewhat insidiously asking (this is my opinion for the record) why other airlines disrespect you enough to think that they can charge you more money for no actual reason, without you noticing or caring. All and all i think this is a great example of what my dad often admonishes me not to do: They are being dollar-wise and penny-foolish. The airline industry is having troubles. For sure. To think that the solution to this problem can be solved by nominal extra fees to a dwindling consumer base and not by dealing with rising gas prices and alternative fuels, is micromanaging the little things while overlooking the bigger overarching problems. And I, for one, won't be paying for this industry's shortsightedness.